A few weeks ago, we announced Ohio South’s ground breaking ‘KickCash’ member benefit for every single one of our Ohio South families. You can find that original announcement here. That was just the beginning! Today, we are thrilled to announce that Ohio South and Kick Cash are announcing an incentive revenue sharing plan for clubs in Ohio South. This is another exclusive member benefit we are pleased to offer. The more club members you get to sign up, the more you earn. Get enough of your members on board and build a new scholarship fund...or start saving for a new field...or use it for new equipment...the possibilities are endless! The process is quite simple and very easy to roll out. Upon 50% of your registered club families enrolling in KickCash, your club will begin earning 5% of the entire daily cash back earned by all of your families in the KickCash’ program. This is in addition to the cash back your families will already earn, and in addition to the cash back your club earns if it uses a club credit card. Once your club reaches this benchmark your profit sharing revenue begins automatically. Help us promote the program to your families by passing along promotional materials and emails explaining the program. KickCash will also provide you all the materials already co-branded with your club logo for no charge! The more you encourage use, the more revenue will be created for your club. Absolutely not. This is not a fundraiser. 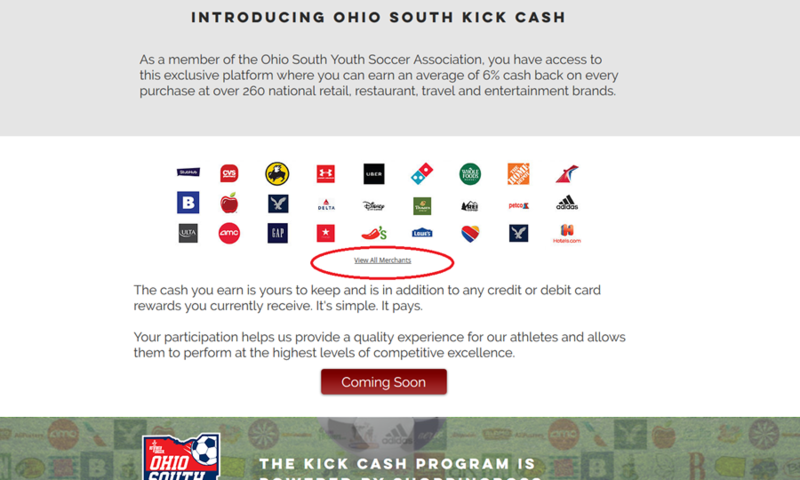 KickCash is a member only benefit available to Ohio South Members and closed to the public. This is an optional program, but has tremendous potential for all clubs. When rolled out in other organizations, the average cash back to families that utilized the app was $400.00*. At those rates of return, the cash back to your club would be $20.00 per player. You do the math for the number of players in your club! The more you promote the program, and the more parents sign up, the more revenue your club receives. To view the list of over 260 national vendors who participate in Kick Cash and their Cash Back percentage, visit: https://www.kickcashapp.com/ohiosouth, scroll down, and click 'View All Merchants'. See image below for example. Contact KickCash at info@intractvmrktg.com to receive your FREE Ohio South and Club co-branded promo materials. Set up your own 10 minute webinar for your staff outlining full program details and explanation. Contact Mike with KickCash at 800-793-1276 to start earning Kickcash for your club! OSYSA is genuinely thrilled to announce this truly ground breaking Ohio South member benefit and we hope you'll take full advantage of it. *Based on research of the current national average.